I cannot even begin to express how delicious this Chipotle Pumpkin Black Bean Soup Recipe was! 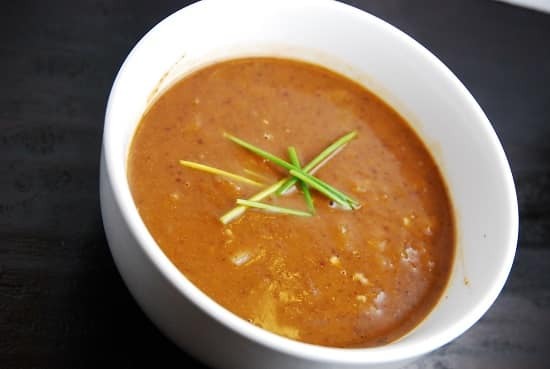 I know it’s officially spring, the weather is getting warmer, and the last thing we want is a hearty pumpkin soup to remind us of the cold weather season. BUT…this soup is absolutely worth it. I was inspired by Rachel Ray’s version which I recently came across. But my version is very different from hers, and a lot less in Weight Watchers Points. Using non-traditional flavors with pumpkin (like cumin and chipotle) really brought out some wonderful new tastes. And the roasted onions and garlic added such an amazing flavor! This soup turned out incredible – and, all that fiber made it so filling! Each nicely sized serving is just 3 Points. I had a bowl of this soup with a side salad for lunch, and I was totally full until dinner time. So don’t push back that canned pumpkin in your pantry until next fall…use it right now in this incredible Chipotle Pumpkin Black Bean Soup Recipe. You will love it! An amazingly delicious and hearty fall soup recipe, this Weight Watchers Soup will not disappoint! Filling, flavorful, and just 3 Points, you won’t be able to wait until fall to get this dish on your table. Spray a baking sheet with non-fat cooking spray and place onions and garlic on it. Place in oven and let cook until onions begin to blacken on the edges, about 15-20 minutes. In a blender, puree the black beans with the diced tomatoes, onions, garlic, and 1 1/2 cups of the vegetable broth until smooth (depending on the size of your blender, you may need to do this in 2 batches). You can also make this a bit chunky if you like, just use the pulse option during your puree. Place a Dutch oven or large sauce pan on medium high heat. Add in the puree from the blender, the canned pumpkin, and the remaining broth. Stir well to combine all ingredients. Bring to a simmer, then turn heat down to medium low. Add in the seasonings, cover, and let cook for about 30 minutes, stirring occasionally. Stir in vinegar, and let cook for another 5 minutes. Serve immediately. This soup was FANTASTIC! Filling! I had it for lunch throughout the week and paired it with various salads and vegetables – kept me full all day! Wonderfully easy as well. I added less balsamic (about 2 tbsp) and was delicious, more may be over powering. I also just sautéed the onions and pre-minced garlic with a little of the broth to save on time and I don’t think it took away anything. I will make this again! I really liked this up until I put the balsamic vinegar in. Is it really 1/4 cup? I like the acidity, so I did use 1/4 cup, but if you feel that it’s too much, just cut it down to 2 tbsp. I just made this soup and I want you to know I thought it was amazing! I can’t believe its only 3 points +! I served it with fresh cilantro and a spoonful of plain nonfat Greek yogurt. Perfect dinner for a chilly fall night!